Good afternoon, I'm Stephen Gilmore. Bob was my big brother. That's us in the photograph. Bob is immediately recognisable because of his distinctive red plumage. I'm the other one. I’d like to tell you about Bob’s early life. 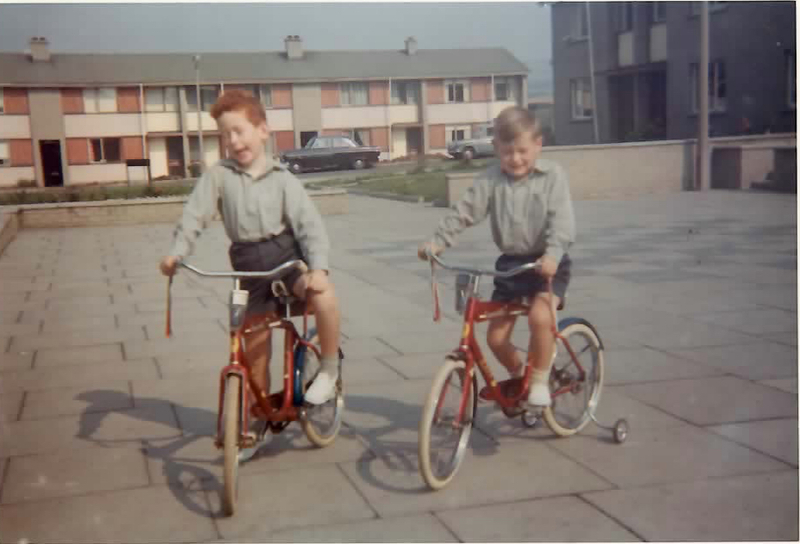 We grew up in Carrickfergus, in Northern Ireland, and being Northern Irish was a big part of Bob’s identity. He wrote an essay about it; it’s on his website, entitled “On being Northern Irish”. In his typically forthright style, in his essay Bob describes growing up in Northern Ireland in the 1970’s as “utterly, utterly shite”. Having been there at the time, I can confirm that was pretty much the case, but what made it rather better, indeed much better, was growing up with Bob Gilmore. I enjoyed every moment I spent with him, and we remained friends our whole lives. 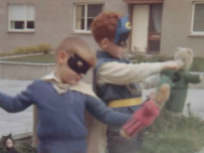 Being Bob’s younger brother, when we played together Bob would get to be Batman and I would get to be Robin. 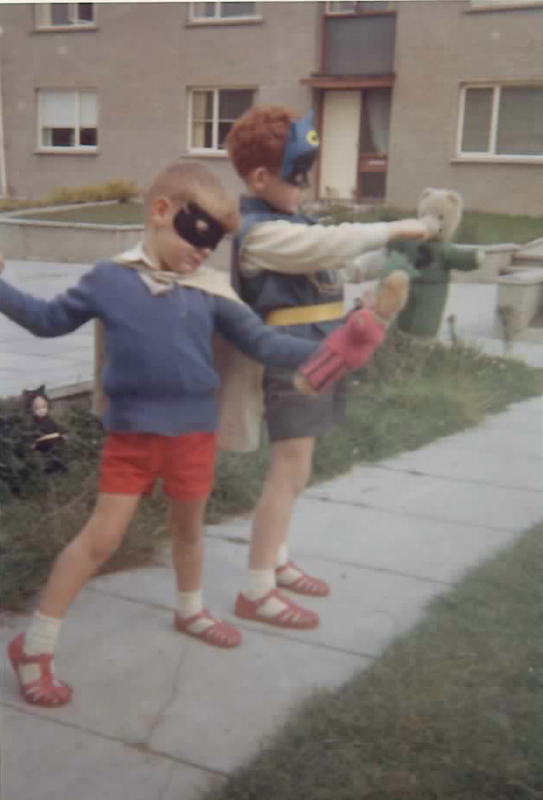 In a photograph taken in the front garden of our family home in Carrickfergus, Bob is dressed as Batman and I am dressed as Robin. We are fighting crime, and Bob is punching Batman’s foe, the Riddler. Playing the part of the Riddler is Bob’s childhood teddy bear, Snowy Bear. When Bob had a son of his own, he passed this much-loved little teddy bear on to Benjamin who, as a child, greatly enjoyed playing with Snowy Bear too. When Bob was spending his last days in the hospice here in Amsterdam, Benjamin was kind enough to think to bring along this little teddy bear, in the hope that it might bring back memories of childhood and happier times. It’s one of many acts of kindness and thoughtfulness that I’ve seen Ben display down through the years both towards his father and others. What a wonderful young man he is, and a great credit to his mother and father, his Russian grandparents, his Irish grandparents, and his whole family. 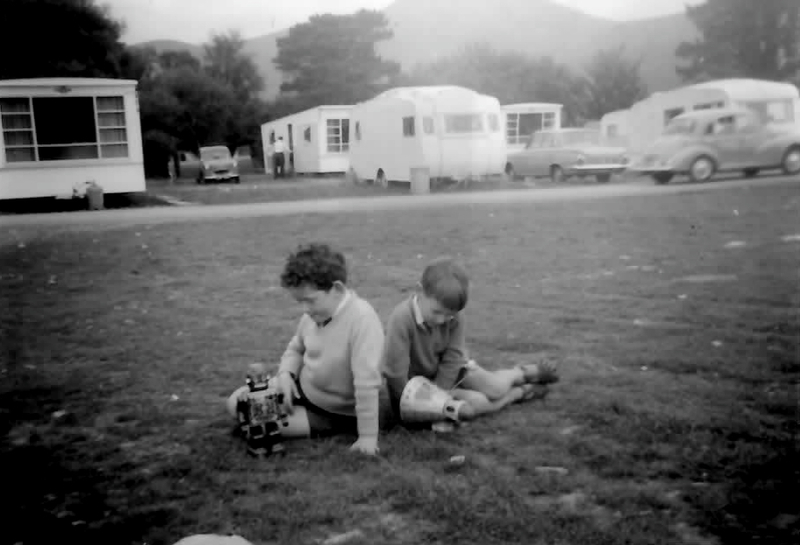 Well, when you’re done playing with teddy bears and other toys you can play music together and, although I had no sense of being musical myself, I learned to play the guitar enough that I could play music with Bob in the dining room of our family home together with my school friend, Mervyn Johnston, a much better guitarist than I. The three of us made up and played silly songs together, and had a lot of fun doing so. I was very happy to be part of Bob’s band, but I knew that music was not for me so I gave up the guitar and became a computer scientist at the University of Edinburgh. Bob, of course, continued playing music. One year, Bob realised that he had forgotten to send me a card for my birthday. In recompense he made a little comic song and sent it to me by email. Bob might have been thinking of the fun that we had on those childhood afternoons together playing music in the dining room of our mother's house. In the song Bob refers to me as “Uncle Stevie” although I'm not his uncle, I'm his brother. This name came about because, when he was a very small boy, Ben had difficulty saying “Uncle Stevie” and used to call me “Uncle T.B.” which was cute and adorable and funny, so the name just stuck. Ben would call me “Uncle Stevie”, as he has every right to, and so would Bob. When Maria, Ben's mother, wrote to me last week she started her email "Dear Uncle Stevie". Perhaps I'm just an avuncular sort of fellow. Anyway, Bob is going to sing to you now and play his keyboards. and wrote this song without a by-your-leave. My brother is a decent man, he's got a job. The University of Edinburgh stops him being a slob. I'll tell you this wee secret and I'll say it slow. Uncle Stevie is a Boogie Man. He really likes to boogie, and to sing this song. He'll boogie-woogie-woogie round the town. He really likes to boogie, and to get on down. And when they're done with thinking, they like to drink a lot. But there is one thing he likes to do a whole lot more. [Ugh, the guitarist's still down the pub. I don’t know if Bob thought much about the music that would be played at his funeral, but it’s probably pretty safe to assume that that song wouldn't have been top of his list. Nonetheless, it seemed like the right one to me because whenever I hear my birthday song it reminds me of how much fun Bob was, and what good company he was. I hope that when you think of Bob that you will think of him kindly and remember the fun that you had together with him. For my part, I will simply miss him more than my limited powers of expression will allow me to say.